So recently after the winter hiatus I got back into airsoft, kicking off the spring by picking up LCT’s AS-VAL. Below is a short video of the unboxing when I received it from Julian at Airsoft Gear back in May. The gun is built solid as a rock, as you would come to expect with LCT’s build quality. Most of the components on the gun are made of high quality steel, everything from the suppressor to the receiver and the stock. It certainly adds to the weight of the gun but its not overbearing. After about a month or so of fielding the gun it definitely lives up to the LCT internal quality. In the time I’ve had it I haven’t done any upgrades to it, its bone stock and I wouldn’t have it any other way. With the stock build the gun can effectively reach out to 180 ft +. Currently I have no plans to upgrade the gun until something breaks, but something tells me that will be a while. Additionally the AS-VAL features the rail bracketing system allowing a User to install a scope mount onto the side of the rifle easily. On top of that LCT has just released suppressor rail adapters which allow the user to add a vertical grip, flash light or other accessories to the front end of the gun. The only con I see with the gun, which is incredibly minor, are the mags. 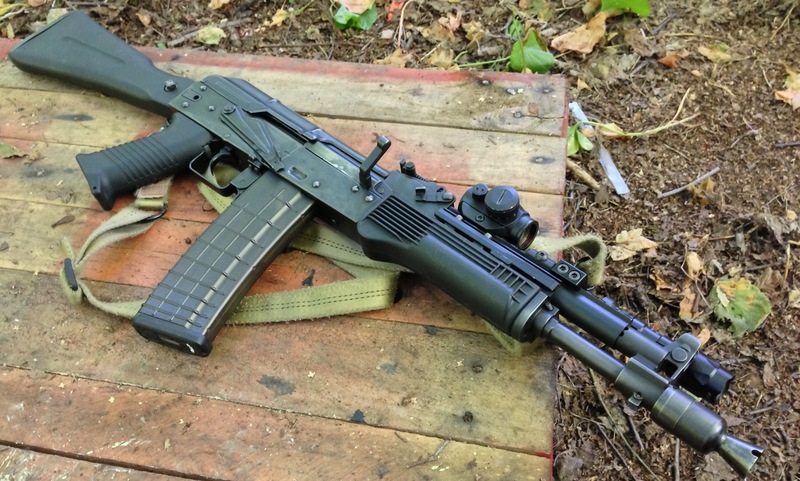 The AS-VAL has proprietary mags so you need to order the specific mags to run the gun. Currently LCT only has low-cap mags at 50 rounds each. While King Arms, G&G and Echo 1 all have AS-VALs or VSS Vintorez on the market I haven’t had the opportunity to test out compatibility. On the plus side, the mags are just a little larger than M4 mags and can easily be run in M4 pouches. Later on I’ll add some more photos for detail. Carrying a second AEG onto the field is something I really only do during longer sims/ops. 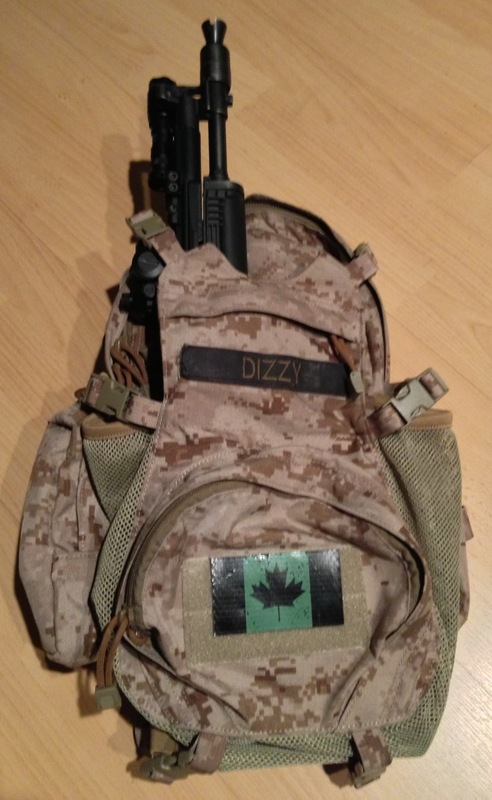 In the past I’ve just paracorded the AEG onto the side of my pack and hoped for the best. I was considering carrying a secondary AEG onto the field for Operation: Iceback – before I found out that the ammo limits are shared between any AEGs you bring on the field. Since I’d rather not limit my ammo capacity for my SPR, I’ll be leaving the AK back at base until needed. Enter: a grimloc carabiner attached to one of the many daisy chain loops that run along the top of the Yote, secured to the Magpul RSA on the front end of my AK-104! The gun is now securely latched onto the pack whilst still remaining very easy to access in case of immediate action. 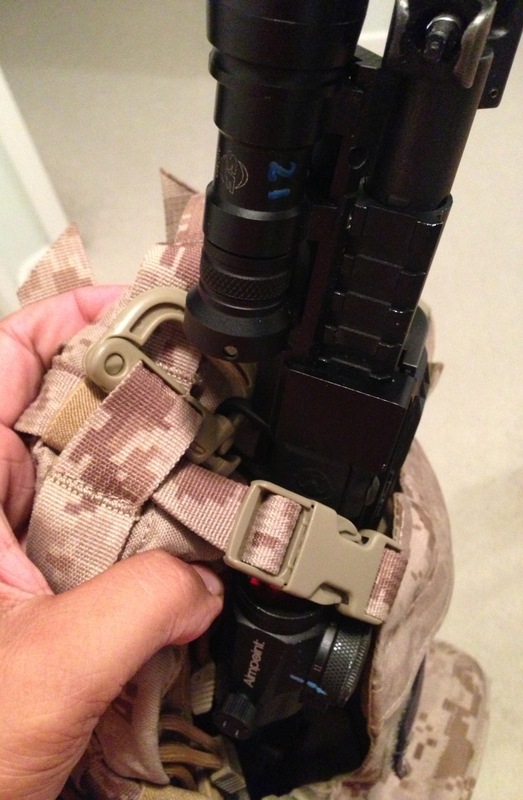 This should work in a similar fashion with most SBRs or AEGs with folding stocks provided they have a front-sling point for the grimloc to attach to. I tested it with my Mk18 Mod0 with the stock fully collapsed and the front sling point was just where I needed it for the grimloc to secure onto the front sling point under the triangle front sight. As mentioned I won’t be carrying the AK-104 with me during Iceback, but this was still a pleasant mini-Geargasm I thought I’d share. With Operation: Iceback quickly approaching, I figured that I should probably start hammering down my guns and gear loadouts. 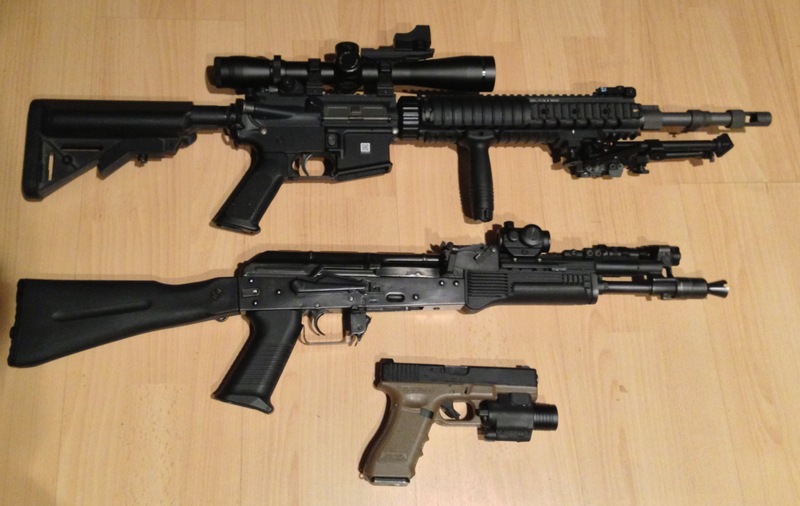 Above is a pic of the guns I’ll be taking with me to Iceback. After the break is a quick rundown on each gun and why I’m taking it with me to Golden.